Sending a text message is simple with AutoAlert. Follow this guide to learn how to easily send text messages from your computer to your colleagues, customers or suppliers. You have various options including sending an instant message, an SMS message or a tweet. To send a text message, simply click Send SMS to open the message sending window. You can select a telephone number from any of your contacts or employees. If you want to send a message to a different number, select Other at the bottom of the list and enter the new number in the new telephone number field which appears. You can then write your text message (maximum 165 characters) and click Send SMS. 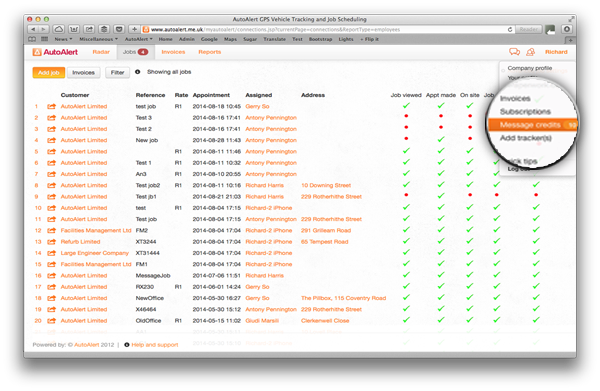 With AutoAlert you can also schedule a message to be sent at a later date. This is ideal if you want to remind yourself or someone else of a job or action that needs to be done at sometime in the future. To send a message at a later date, simply click the Send at a later time check box to open the send later date field. You can use this date, or overwrite it with your own date. Bundles of message credits can be purchased by clicking your name at the top right of the screen. This opens a list of options including the Message credits option. You can see how many message credits you have left. If you are running low, click on the Message credits option to buy a new bundle. Message credits don’t expire. They are used for any text messages sent from AutoAlert, including configuration messages sent to your GPS devices or device alerts i.e., if an alarm has been activated, if a vehicle has entered a specific area, if its speeding, or if it has been stationary or idling for a long time. 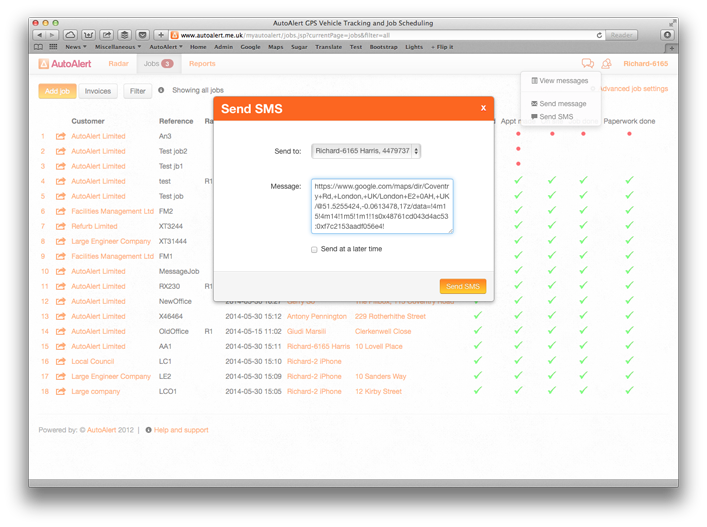 Find out more about AutoAlert Messaging.